Keeping this classic car running smoothly. 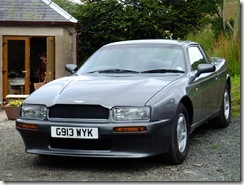 The Virage can be had for relatively low prices, given it’s beauty (to the eye of this beholder) and rarity. We are reasonably convinced that part of this can be ascribed to the apparent difficulty and expense of maintaining them. Although when it goes, it goes very nicely, that period of nice going can be a short-lived affair. This post will cover our experience in fixing the mechanical and electrical problems of the car. To my surprise, all the serious issues can be addressed relatively cheaply – transforming the car from a beautiful, but temperamental oddity to a true pleasure to own, drive, and maintain. All these solutions have been found and addressed by my extremely talented and diligent brother-in-law G**ry. They are noted here in the hope that other Virage owners may find the information useful, and in a faint hope that the information may help rehabilitate a wonderful car’s reputation. The very small production run of the Virage meant that little experience was built into the car over the 3-4 years of manufacture. My car is chassis number 30, very close to the start of production. Our friend J**n, whose car is stored next to ours in Yorkshire, has chassis number 331, very close to the end. The cars are almost identical, with only very minor changes being made. The ECU location has been changed from the front wings to underneath the driver and passenger seats. The fuel filler flaps open differently to allow the flaps and the boot to be opened at the same time. And the engine mapping has changed to cover the more stringent emissions after 1991. Other than that, mechanically and in performance spec, the cars are identical, and suffer identical problems. These problem are compounded by the lack of knowledge of most Aston specialists on the Virage, despite what they may tell you. Over the last 9 years we have spent a huge amount with various Aston dealers to fix continuing problems with the running the car. It turns out that almost none of that expensive work was needed. In fact the unreliability of the car was almost entirely down to two key problems, both easily fixed, and both missed by every shop we have taken the car to. The symptoms we experienced over the years were pretty troubling. The car would often come to a complete halt, after the engine ran roughly for a short while, and then would not start for some time afterwards, if at all. It would often do this in tricky positions, on the exit ramp out of a French supermarket for example. After that experience, driving it onto the Channel Tunnel train at the head of the queue, and wondering if it would start on arrival in Folkestone was a particularly tense experience. For an extended period the car would start at the normal 1000 rpm tickover speed, and then rev up to 3500 rpm, and stay at that tickover permanently. At 1000 rpm the car moves forward at a comfortable speed in traffic. At 2500 rpm the car runs at 75-80mpm in top gear. At 3500, its normal top gear speed is over 100mph. This is not a convenient speed for driving around town, and the experience was fairly terrifying, particularly in the medieval French and Spanish towns where we first encountered the problem. The immediate cause of this appeared to be incorrect functioning of the air admittance valves at start-up. The only way we were able to control it was with a G**ry-fitted switch that closed the valves until the engine was warm. The car would often run roughly without any particular warning or reason, misfiring at speed, and failing to achieve a smooth tickover. Occasionally it would not start at all, requiring a hugely expensive trip to an Aston specialist. The tappet noise was pretty loud, and sounded as though the 32 tappets were badly worn. These problems were all due to two characteristic Virage issues. There is a pretty fundamental rule for the Virage. Do not leave it out in the rain. The rain affects both the electricals, and the bodywork, but is particularly bad for the fuel system. The lovely looking fuel filler flaps conceal a fundamental design flaw. The fuel cap is in a recessed tray, with a narrow diameter drain hole at its base – see below. The drain hole is easily blocked, and when this happens, the entire tray fills up with water, and this then starts leaking into the fuel tank. J**n recently took his Virage (which had been running perfectly up to that point), on a run to Stratford. Overnight, it rained heavily, and the next day the car behaved so badly it had to be relayed back to base. 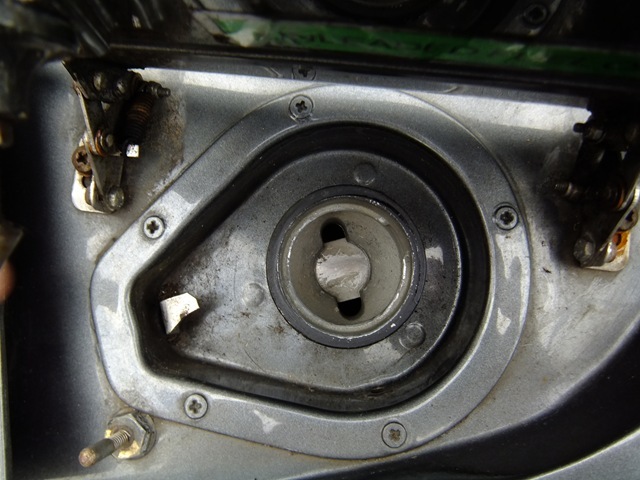 G**ry removed 6 litres of water from the petrol tank – unsurprising that the car ran a little roughly! 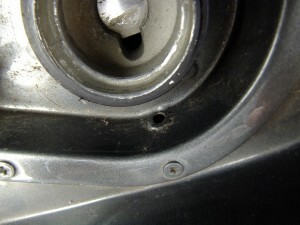 The drain hole can be seen at the bottom of the filler cap in the photo to the left. 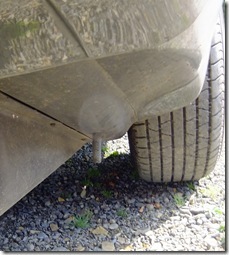 And here you can see the drain pipe exiting just behind the rear wheel (in the centre of the photo). To eliminate water problems: a) don’t allow the car to sit in the rain, or at least keep the fuel flaps covered. b) regularly clean out the drain holes and drain pipes with an air hose (it’s best to apply air pressure from the bottom of all the hoses), and c) Keep the o-ring seal on the filler cap in good condition, and don’t allow it to twist out of position when replacing the cap. 2. Cracked and split piping in the engine vacuum system. This turned out to be the cause of most of the engine problems we experienced with the Virage. 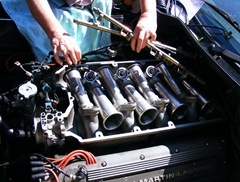 Two Polyvon flexible vacuum tubes run from underneath the Plenum chamber and are connected via a number of t-joints, to the absolute pressure sensors, the fuel pressure sensors, and a vacuum reservoir, Maintaining the correct vacuum influences almost all engine functions including mix, timing, fuel pressure and of course cold starting. These pipes are largely hidden by the plenum chamber and pipe work for the water cooling system, and it was only when, suspecting this problem, G**ry removed the Plenum chamber that their true condition was revealed. The pipes on my car were the original 20-year old Polyvon stock and were in appalling condition. Later, we found the vacuum system in a similar condition on J**n’s 3 years younger car. 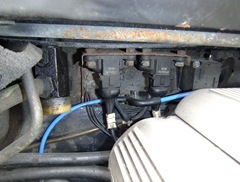 By the way, the car heater valves are also operated by manifold vacuum .The heating system has its own reservoir, and pipes lead through the bulkhead from this into the heater controls. Although less critical, these pipes also crack on the engine side, and will affect the overall manifold vacuum if damaged, so they are also worth replacing (ours were in a very bad way). The cruise control is also operated by vacuum, but via a separate electric vacuum pump, and we have not yet got to the bottom of it’s operation (the CC on our Virage is currently non-functioning). In the photo to the left,looking towards the bulkhead, the plenum chamber is in place, and the new vacuum piping (in blue) can be seen. Much more piping is below this level – the replacement job is so complex because it of the complexity in disassembling the plenum chamber, and then reaching the bulkhead fittings below the chamber. Removing and replacing the pipes took G**ry (who is a gifted engineer), around 15 hours! Over the first six or so years of ownership, we sent it to a number of Aston dealers or specialists to try to get the problems fixed, spending around £15k in the process. None changed or even commented in the state of the vacuum pipes. Of course changing these pipes is a fiddly and unpleasant job. That’s why most Aston dealers don’t touch them, even if they are aware of the problem. But it’s the decay of this pipework that creates almost all our problems of engine management. Replacing the pipes when the cylinder heads were off would have been even easier – it’s doubly irritating that the very prestigious main dealer that replaced the tappets and (allegedly) one of the head gaskets did absolutely sweet f.a. in this department despite charging thousands for the job. When dismantling the plenum, we found this same dealer had tripped the thread of one of the plenum chamber bolts, and instead of rethreading it, just silicon glued the bolt in place! With new nylon pipes in place, the car runs sweet and true, never misfires, and starts up perfectly. And the apparent tappet noise has also been fixed. The true source of the rattling was the air admittance valves rapidly opening and closing due to the random vacuum fluctuations. Now, when the car is warmed up, the once very noisy ‘tappet’ sound has disappeared completely. We were charged thousands by that main dealer, for the unnecessary job of replacing 32 perfectly OK tappets. With the above two major problems tackled, there are few other major issues when running a Virage. That’s not to say there aren’t other problems, but these mods fixed most of the starting and running issues we ever experienced. In the next post on the Virage, I’ll cover what G**ry found out about about keeping the bodywork from corroding, and sum up our overall experience with the Virage.